I'll give you a little story. Volunteer Jodi was nice enough to set us up with someone from Washington D.C. that had a husky that they did not want in Oct 2007. So on a Saturday, Jodi and the Stillermans met at our house in Manheim and brought the beautiful Neve to our house. Neve met her new brother Ridge, and I don't think she thought much of us or him for awhile. Unfortunately Ridge was only here for seven months after Neve got here. Neve never lived with any brothers or sisters so we thought we better get her a new partner before she got used to being alone again. 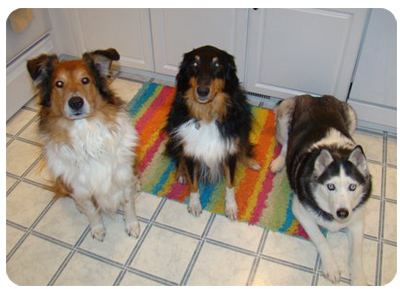 So in June of 2008 Sasha arrived and they got along together fabulously. Everybody thought we needed a brother so we decided to try for one. Unfortunaly Tails of the Tundra didn't have a brother for us, so we found the poor unsuspecting Beau online. So, in August 2009 Beau came from Maryland to live with us. Now Neve likes to let him know that she is the princess and rules the household. She eats first in line and lays at all the premium spots. She desqueaks all toys and then they are fair game for everyone else. She gets front spot in front of the fan and always gets the freeze pops first. 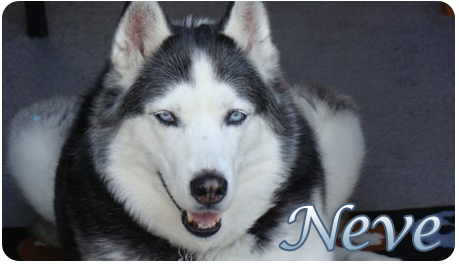 We love Neve very much and are very grateful for your introduction to the Husky. We couldn't be happier.